SCOLA is a non-profit educational organization that provides authentic foreign language resources in more than 175 native languages. I sit down at my computer and soon I am off on my next adventure with SCOLA‘s newest and most exciting service, Savoir-Vivre. So far with Savoir-Vivre I have been able to travel to a zoo in Macedonia where I discovered komodo dragons in Indonesia and migratory birds in Japan, and I also visited a hotel in Thailand where it was recommended I try the delicious food at Mozem Soba House in Japan, and went on a family holiday in Port Harcourt, toured Bhaktapur City in Nepal, and went dolphin watching in Bali! With all this adventure you would think I’d be worn out, but traveling the world with Savoir-Vivre is made easy! All it takes is a few clicks of my mouse and I am ready for my next journey. Spring has sprung here in Iowa, and many plants are starting to bloom. This makes me wonder what kind of plants are grown in other parts of the world, and where could I buy them? I click on the flower icon on the Savoir-Vivre map to find out. I’m instantly transported to the streets of Iran where I can walk forward until I find a flower shop called Aftab. I explore the flower shop and quickly discover Native Plants found around the world. I travel to India where a group of people plant trees on World Environment Day, to Turkey where a man sells cactus on the streets of Mersin, and then to Syria where I meet women working on a cotton farm. A short time later I am exploring different flower shops in places like Georgia, India, and Indonesia. After my adventures I find myself back in Aftab, ready to see where Savoir-Vivre will take me next! I may not have the time or money to travel around the world learning about other cultures, but that didn’t stop me from experiencing several countries today! Join me on my adventure with a free log in for our blog followers. User username WordPress and password Scola2015 at www.scola.org to access Savoir-Vivre and other wonderful SCOLA services for FREE! Many of you have been following my travels with On the Street Videos since Week 1 when I visited the Philippines. But as of last week there is a new service on SCOLA and it’s going to take us on a totally new international adventure! Savoir-Vivre is a global adventure in culture. Travel the world. Discover its people. Explore new lifestyles. No passport needed! Log on to www.scola.org today and access your free trial! In the past I have only traveled to one country per week with SCOLA, but I am so excited to travel with this new service I visit many, many more! 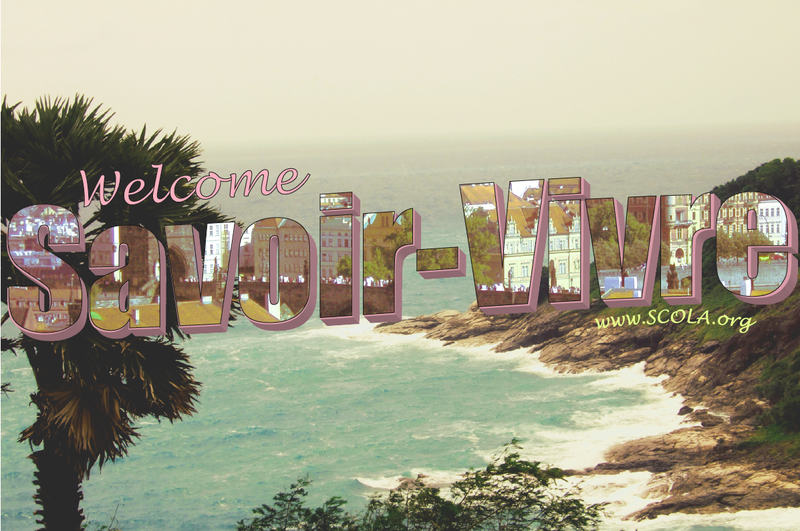 Savoir-Vivre actually allows you to visit through real cities and places from around the world. My first stop is a travel agency in Germany where I learn how to navigate the streets of Savoir-Vivre. I visit the street in Germany and am able to see buildings just as I would if I were actually walking down the street…I am even able to turn and face each building head on! I continue down the street, stopping once to learn about transportation in other parts of the world. Once I get to the end of the German street I click on the map icon to see where else I can visit in the service. I see a lion icon and wonder where that will take me…I click it and suddenly I am on the streets of Macedonia! In Macedonia I am able to visit the Skopje Zoo, where I discover other zoos, birds, marine life, mammals and reptiles from around the world! Want to see komodo dragons in their natural habitat? Visit Komodo Island in Indonesia! More interested in birds? Check out a flock of migratory birds on the Abukuma River in Japan! There is so much to experience on Savoir-Vivre, but I don’t want to give it all away! Go check it out for yourself today at www.scola.org! Join us for our annual Users Meeting! Our 2015 SCOLA Users Meeting will be held May 21st and 22nd in Omaha, Nebraska and McClelland, Iowa. The SCOLA Users Meeting gives our subscribers the opportunity to connect with each other and experience Midwestern hospitality at its finest.